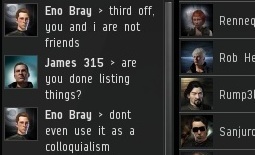 One of my general principles in bringing order to highsec is that I don't hold onto grudges. If someone wrongs me, I am quick to forgive him or her in response to any sincere apology or act of remorse. 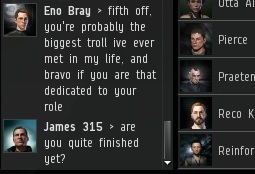 It just makes sense: Since I am going to take over all highsec, and since I am going to convince everyone to join my cause, all of the miners who mistreat me are people I'll eventually end up working with. Therefore, forgiving them of their crimes defuses potentially awkward situations. Many miners take the opposite approach. They tend to stew in their anger and hold onto vendettas for dear life. I feel sorry for them. That kind of thing can't be healthy. Consider the case of Eno Bray. This past weekend, I spent a brief period of time enforcing the Code by bumping him out of mining range. He can't claim innocence: Not only did he violate the mining fee provision (by not paying it), he also showed me disrespect and stirred up rebellion while I was bumping another miner. I invited him to put aside the ways of the past and join the New Order, but he refused. He seemed angry about being bumped, which was odd--I may have bumped him for a few moments, but what about all the time I didn't spend bumping him? 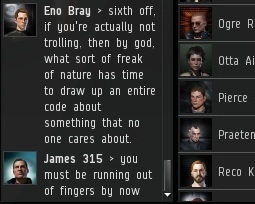 I didn't think much of it until Eno Bray reappeared in Kino yesterday. While I was enjoying a good session of AFK cloaking, New Order Agent Neltharak Idrissil spoke in local. 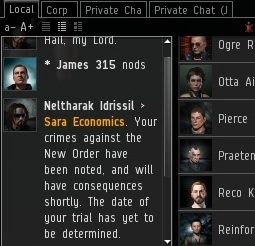 He was just dropping by to deliver a message to Sara Economics, who you'll recall was implicated in a recent plot to get me permabanned from EVE. 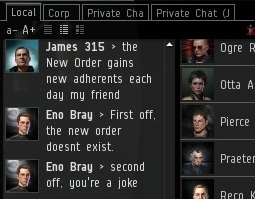 Eno Bray showed up, disgusted by the sight of another supporter of the New Order. I kindly informed my future friend that the New Order grows every day. I didn't think it was controversial to say so, since it's objectively true. Incredibly, Eno Bray was still sore about having been bumped the previous day. I decided to interrupt his tirade and get him back on track. He IS a miner. Genetic degeneration of his character isn't impossible. It's therefore perfectly possible to have 6 fingers. Riddle: How many fingers does it take to become a successful miner in highsec? Well everything would depend on the definition of "Successful". In my book, a turret fitted suicide-ganking hulk roam might be a success. Then it would take more than one. However, most miners out there have no such goals. Therefore i would say one. i have polydactlism. so there plus. im not a miner, im just doing it to get money to go out to null again. and bring it on, ive survived a five man gank in a simple retriever. good luck against any of the new barges. with that i shall leave you.